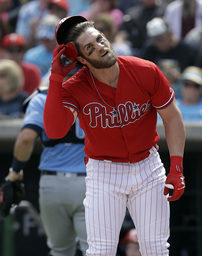 CLEARWATER, Fla. (AP) New Phillies star Bryce Harper sustained a bruised right foot when he was hit by a pitch during a spring training game Friday, but manager Gabe Kapler said the team wasn't overly worried about the injury. Initial X-rays were negative, the club said. Harper then left the ballpark for more detailed X-rays. Harper had hoped to play three straight games starting Friday. "I think it's a little premature to speculate on lost at-bats or anything like that," Kapler said. "First and foremost, we probably have to get inside and meet with our medical team and discuss it. But again, not overly concerned right now."